Flamingos might seem out of place in Patagonia, far from the tropical lands where we usually imagine them, but Chilean flamingos (Phoenicopterus chilensis) are regular inhabitants of numerous lakes and lagoons in the Chacabuco Valley. A substantial population of flamingos feeds at Laguna Seca, a shallow lake about 10 km east of the main park headquarters on the main international road. Migratory birds, these flamingos spend the spring and summer months here, usually from October to the end of March. The Chacabuco Valley serves as a corridor to the Argentine steppe to the east, where the birds head for the winter in search of the milder Atlantic climate. Chilean flamingos, pinker than the slightly larger Greater Flamingo but paler than the Caribbean Flamingo, are distributed in temperate South America from Peru south, inhabiting alkaline or brackish shallow lakes. Standing four to five feet high, Chilean flamingos are large birds that weigh thirteen to sixteen pounds. Gregarious, social birds, they live in flocks of up to several thousand individuals, breeding, feeding, and flying all together. Flamingos can live for up to 50 years in the wild. Other species of flamingos live in the Caribbean, Africa, southern Europe, and south to southwest Asia. 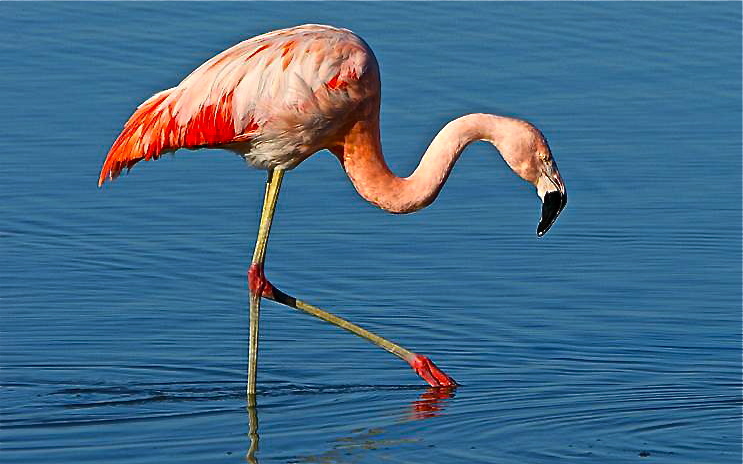 The name “flamingo” comes from the Portuguese word for “flame,” appropriate for the bird’s bright color. 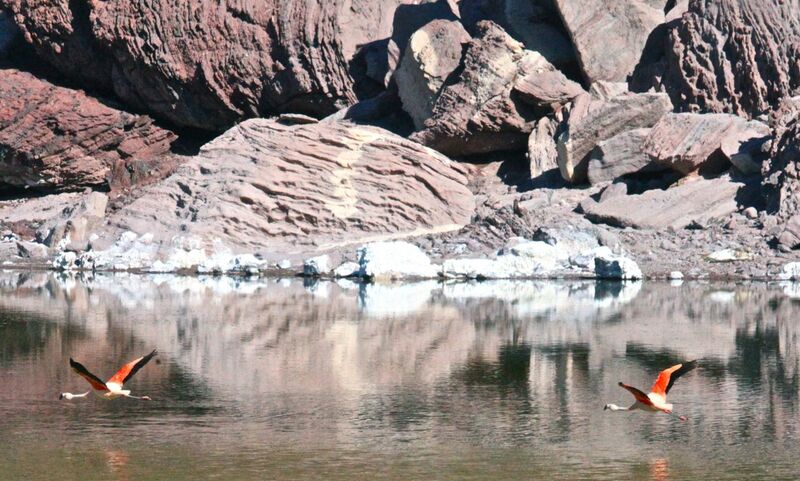 Like other species of flamingos, the Chilean Flamingo lays a single egg on a mud mound. The chick hatches after about a month. Both parents nurse it with high-fat “milk” produced in glands lining the upper digestive tract. The chicks feed on this milk for two months until their bills are developed enough to filter feed. Young flamingos hatch with grey plumage, becoming pink as they eat animal and plant plankton, which contain carotenoid proteins that supply the pink coloration as digested. Vibrant coloration indicates good health and nutrition, making a bright pink flamingo a more desirable mate. To feed, flamingos sweep their bill upside down through shallow water, filtering plankton through their finely toothed beak by pumping their tongue up and down rapidly. As frequently depicted on lawn ornaments, flamingos often stand on one leg, keeping the other tucked beneath the body. Standing in this manner helps them to conserve heat, since they spend many hours a day wading and feeding in cold water. They typically stand facing into the wind or rain so that the water does not get into their feathers. Although flamingos have few natural predators, Chilean flamingos are listed as Near Threatened, likely to become endangered. Humans represent their main threats, either from hunting, habitat loss, or changes in the water systems on which they depend. They are vulnerable because their large flocks depend on relatively few lagoon and wetland areas, which are fragile and often converted to human uses. Here in the Chacabuco Valley, we’re fortunate to have a fairly large and stable population that can rest assured of the continued wildness of its home turf.